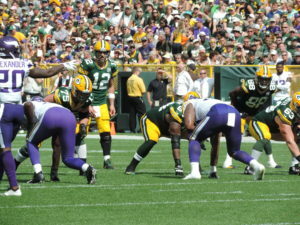 Aaron Rodgers in action against the Minnesota Vikings. As expected, Aaron Rodgers played against rival Minnesota on Sunday, sporting a rather large brace on his sore left knee. But Rodgers presence wasn’t enough to lead the Green Bay Packers to victory, settling for a 29-29 overtime tie at Lambeau Field on Sunday. Vikings rookie kicker Daniel Carlson missed three field goals on the day, including two in overtime that would have won the game for Minnesota. Carlson missed from 49 yards and then again from 35 yards out as time expired. Kirk Cousins hit Adam Thielen for a 22-yard touchdown with just 31-seconds left in the fourth quarter, followed by a successful two-point conversion to tie the game at 29. Cousins finished the game 35-48 for 425 yards, four touchdowns and one interception.